Our solution aims to have a transparency that fosters the interaction between students and faculty and to business and the surrounding community. Our design concept is to have a continuous flow of space that will induce and promote interaction between the people of all spaces. 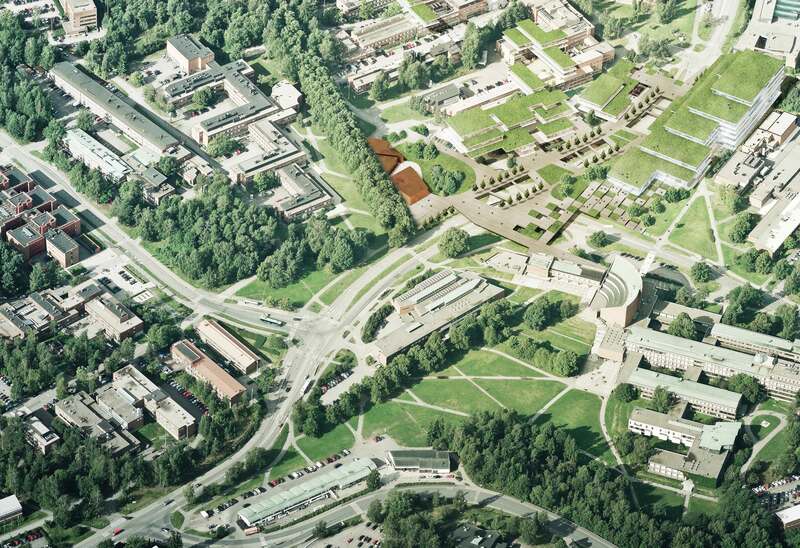 Analysis of the competition area showed that the street intersection of Otaniementie, Otakaari and Biologinkuja and the surrounding parking areas were at the low point of the site and that the nearby buildings including the new Metro Station and Alvar Aalto’s Otakaari 1 are on higher ground by approximately 4 meters. Also, there is natural scenery in the competition area that should be kept and expanded upon in the proposed design. We propose to have the central square above the street level that both strongly connects with the street level and with the nearby buildings at their lobby levels. 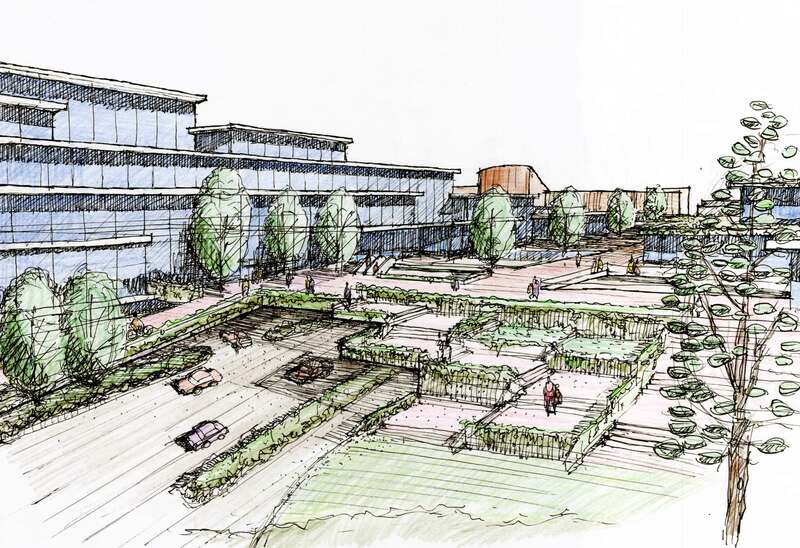 By doing so, the vehicular traffic is separated from the pedestrian and bicycle traffic while creating an outdoor space, the new central square, that connects the nearby existing buildings and the new proposed buildings. Although, the current road system may not be ideal for servicing the existing facilities, it can be improved to provide the service needed. As the new central square will be raised above it, the street is ideally located to service the new buildings. The current central square area at street level will be used to be the primary access to the new central square level. The common facilities building will front this stepping area that goes from street level to central square level. As the stepping area reaches central square level, there will be a main connection to the south side commercial building that will have a planted green area providing relief from the hard plaza surface. This central square on its eastern end connects Aalto’s Otakaari 1 building and the Metro station. At its northwestern end the central square connects the new school building on the north side to the new commercial building on the south side. In between, the central square connects the Metro station to the new commercial building and the common facilities building and new school building. There are numerous stair, escalator, and elevator connections between the central square level and street level. The new buildings have connections to both the street and central square levels. The new east-west linear central square actively promotes the flow of space from the stepped commercial buildings on the south side to the stepped school building on the north side. The new buildings will maximize the transparency of the buildings’ functions with its stepped profile that emphasizes the horizontal with its glass walls allowing people in the central square to see the activities inside inviting them to participate if they so choose. 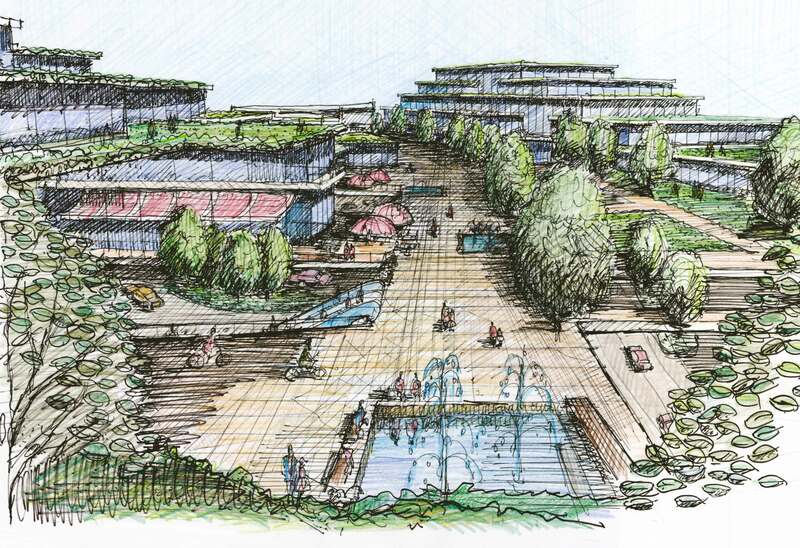 These buildings will all have green roofs to reduce the heating and cooling energy required. 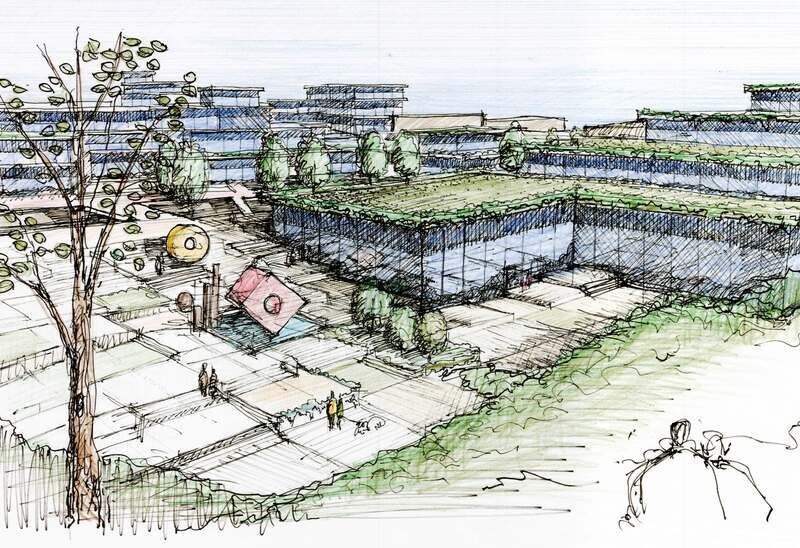 Each major school division will have a green roof for its use. The shared facilities are located between dedicated program spaces to provide areas that encourage interaction between the students of the various school divisions. These shared facilities are located in double-height spaces to make it inviting to all the adjacent uses furthering the cross-pollination of ideas between the various departments at the student and faculty level. Also the common facilities building is strategically located at its central location fronting the plaza to foster the interaction of the various schools and departments. The commercial buildings have been integrated to provide the southern front to the plaza, easily accessible through the central square from the new school, Metro station, Aalto’s Otakaari 1 as well as from the street level. These commercial buildings will also service the surrounding businesses and community creating an opportunity for the school to interact with its neighbors and for its neighbors to interact with the school. The additional spaces required for VTT have been located over the top of the existing VTT buildings where the existing vertical circulations are located. These additions are connected to roof of the commercial building on the south side of the plaza that provides direct access to the plaza. The southeastern portion of the competition area has been preserved with its existing natural fauna. 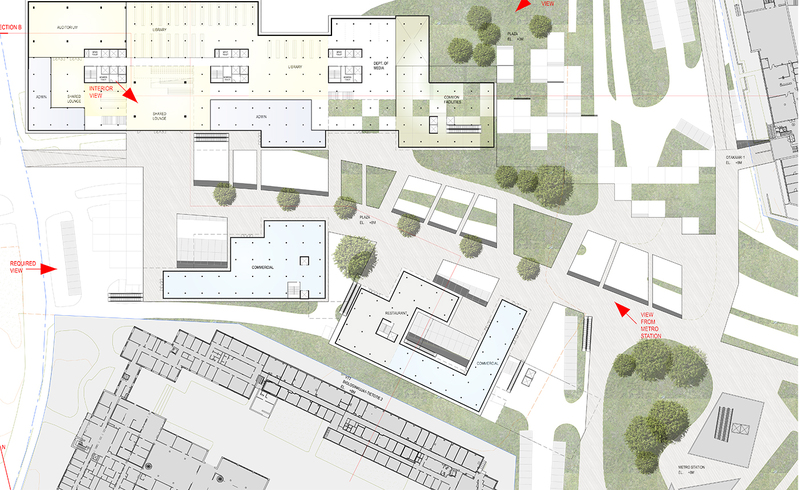 In wintertime, the plaza will make access between the campus buildings simpler by connecting them on the same level whereas currently, the contours of the site need to be negotiated when going from building to building. By keeping the existing street and street infrastructure intact, the ecological impact to the competition area has been minimized. Parking has been kept at street level with openings to the sky to be human friendly. This new central square with its easy access by subway and cars, and from other campus buildings by bicycles and walking will foster collaboration and encourage interaction between the 6 schools and with the surrounding communities and businesses. With its openness and melting pot of users, this new central square will become an impressive landmark created in part by the people using it. Our solution by keeping the street, its infrastructure, and the parking at street level will be most feasible economically and most controllable in terms of project schedule. Also by doing so, this project has the flexibility of being phased if needed. Our proposed design creates a well-balanced relationship between the new central square, the new buildings, Metro station, and Aalto’s Otakaari 1 and Main Library buildings, and the open areas surrounding it generates a critical mass that will be the dynamic focal point for the Otaniemi central campus.